While Elvis performed his standard show over and over in dozens of arenas in 1956, thousands and thousands of fanatic and curious people in each city were seeing him live for the first time. Those audiences gave a unique character to each of Presley’s 1956 stage shows. The unpredictable crowd behavior and each spectator’s personal experience made every Elvis stage show a one-of a-kind event. Below is a profile of one of those crowds. 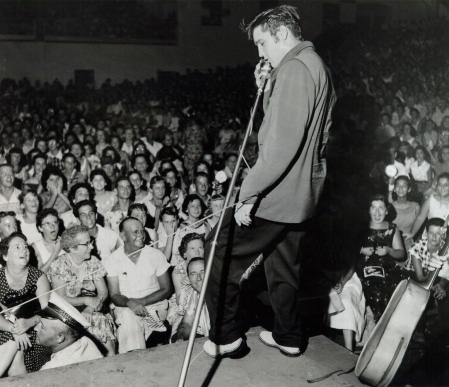 Over 6,500 tickets were sold for Presley’s three shows in St. Petersburg, Florida, on Tuesday, August 7, 1956. The following account is a composite of accounts published in the St. Petersburg Times about the audiences for the 3:30, 7, and 9 p.m. Presley shows that day. Clare Carter and Donna Bemis were first in line at 4:15 in the morning, over 11 hours before the 3:30 p.m. opening show. All the $1.25 advance tickets were general admission, so the best seats would go to those at the front of the line when the doors of the Florida Theatre opened. Clare and Donna, armed with soft drinks, newspapers, and an Elvis fan book, laid claim to the first spot at the corner of First Avenue South and Fifth Street. At 4:45 a.m., they were joined in line by Elvis fans Anne Muncy and Nila Shea. The two blondes were disappointed to see Clare and Donna ahead of them. “We were the first in line to see him in Tampa and Lakeland,” one explained, “but this time we missed out.” Among others claiming spots near the front of the line were Glenda O’Brien and Donna Wyman, who arrived at 5:30, and Nancy Harper, Lin Peters, and Joy Cliett, who settled on the pavement at 6:10. By 9 o’clock those headed for work in the downtown area noticed a sizeable line of people snaking down the sidewalk away from the theatre. Made up mostly of teenage girls, the crowd seemed at its peak when a downpour hit at 11:50. The heavy rain started the line surging toward a small awning along the sidewalk. Most got drenched in the half hour shower, but none gave up their places in line. Times columnist Archie Dunlap noticed how the estimated crowd of 2,000, mostly girls and a few boys, stood its ground before the hard rain. “There must be something about Presley to have such a violent effect on teenagers,” he thought. Uniformed police officers kept watch over the waiting crowd, especially where it lined an alley where Elvis’s car was expected to arrive. The crowd remained orderly through the morning, but as entry time approached, excitement started to build. Chants of “We Want Elvis” began, and police reserves were called in when retraining ropes gave way under the pressure of the compacting crowd. Later in the day, police intercepted 14 teenagers trying to climb a fire escape to reach Presley’s dressing room. The doors opened early due to the rain, and the crowd stampeded in, shoving and pushing to reach the seats closest to the stage. Police Captain “Robbie” Robinson took the rush in stride. “It was just like any bunch of kids all trying to get into the same place at the same time,” he observed. 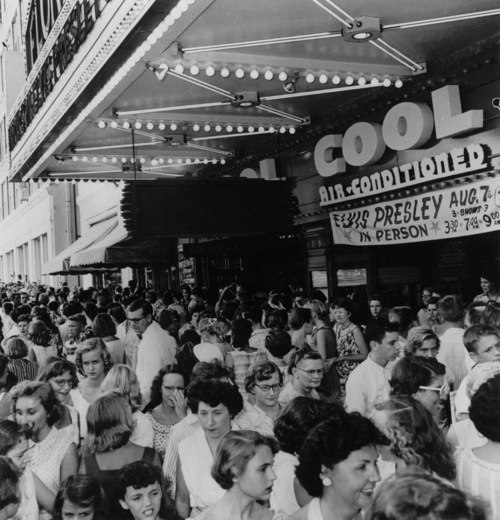 After the 2,500 seats in the theatre were filled, recordings of Presley’s hit records were played over the theatre’s sound system to sooth the excited nerves of his fans. Only occasionally did they clap or yell “We Want Elvis.” Any slight motion or sound from backstage brought shrieks of anticipation from the audience. Another adult set a bad example for the impressionable teenagers there. A mother and her teenage daughter had taken seats in a row close to the stage. Before the show started, the daughter went out to the refreshment stand to get something to eat. While she was gone, a gray-haired woman forced her way into the girl’s seat, even after being told the seat was taken. When the girl returned, the woman wouldn’t budge. An usher summoned by the mother failed in his efforts to get the bandit out of the stolen seat. Then a policeman came and spoke with the woman. When she still refused to leave, the officer moved away, unwilling to create a scene. Before the live opening acts started, a short, musical film featuring bandleader Louis Prima played on the theatre’s move screen. It drew some jeers of “kill the square” from the audience. The crowd settled down and sat patiently, even applauding politely, for the singers and comic-magician who then paraded across the stage. Last before intermission, the Jordanaires received the most applause among the opening acts. Microphone problems on stage rendered Elvis silent for a while, but the uproar from the audience continued. Just seeing Elvis was enough for them. 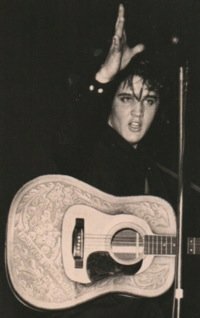 After about a dozen songs, Elvis made his usual quick exit, but it took some time for the pandemonium inside and outside the theater to subside. Police were kept busy calming down hysterical girls running from the theater. 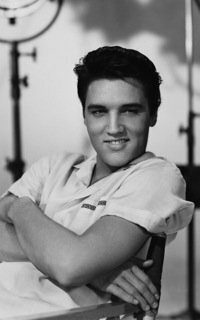 When a teenage girl begged Patrolman Jim Liddle to let her go backstage to get Elvis’s autograph, he gave her the one he had gotten earlier for his sister. 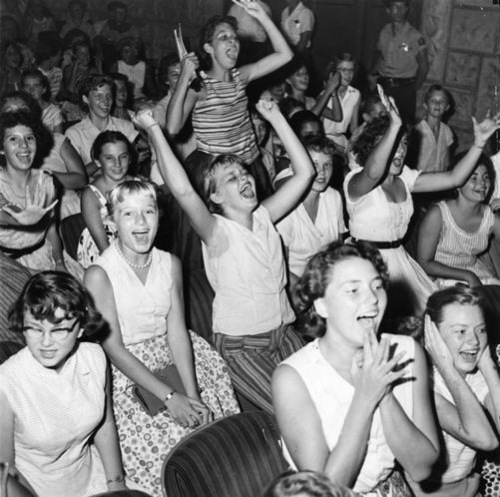 "When the sleeve of a kelly green sport coat through the curtains signaled Elvis’s arrival, the entire audience rose to its feet with the girls screaming en masse. While the girls tore at their hair, the boys looked about in awe."